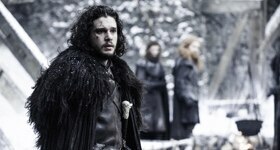 There are huge shocks in store in the fifth season of the smash-hit fantasy drama. 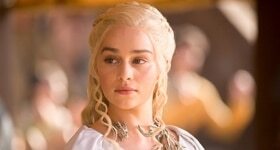 Episode 1 "The Wars to Come"
Tyrion is presented with a new possibility and Daenerys grapples with her tempestuous dragons. 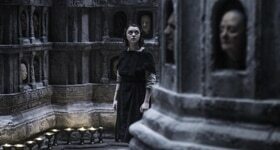 Episode 2 "The House of Black and White"
Arya arrives in Braavos, Pod and Brienne run into trouble, and Cersei fears for Myrcella's safety in Dorne. Queen Margaery spends time with her new husband, King Tommen, while fugitive Tyrion and Varys walk the Long Bridge of Volantis. 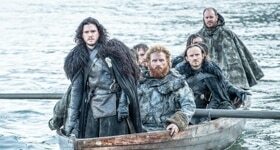 Episode 4 "The Sons of the Harpy"
While the Faith Militant grow aggressive, Jaime and Bronn head south. 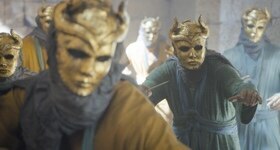 Ellaria and the Sand Snakes vow vengeance.. Episode 5 "Kill the Boy"
Episode 6 "Unbowed, Unbent, Unbroken"
While Arya makes progress in her training, Sansa confronts an old friend. Elsewhere, Cersei faces a struggle. 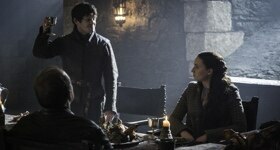 Episode 9 "The Dance of Dragons"